! Do vyprodání zásob ! 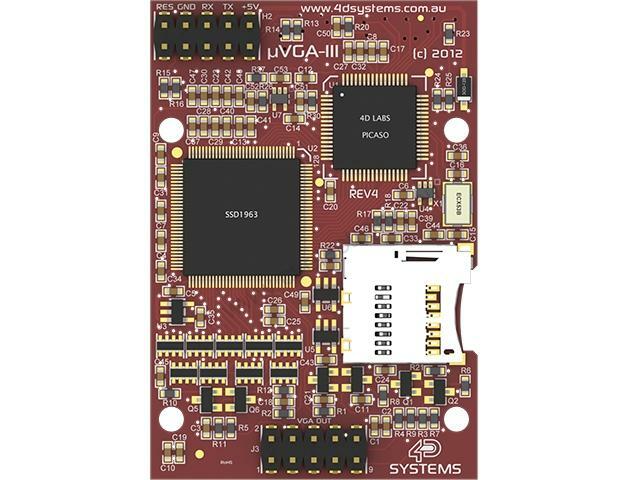 The µVGA-III module is a compact and cost effective standalone VGA graphics engine powered by the PICASO graphics controller. It can provide QVGA/VGA/WVGA graphics solution to any embedded project with its powerful graphics, text, image, animation and countless more features built inside the module. The PICASO works as a standalone device. It allows the user to take complete control of all available resources on the µVGA-III hardware platform such as the Serial Ports, uSD memory card, I/O pins, etc. This eliminates the need for an external host controller/processor to drive the µVGA-III module via serial commands. It provides the user complete control over the hardware module allowing them to quickly develop practical applications. 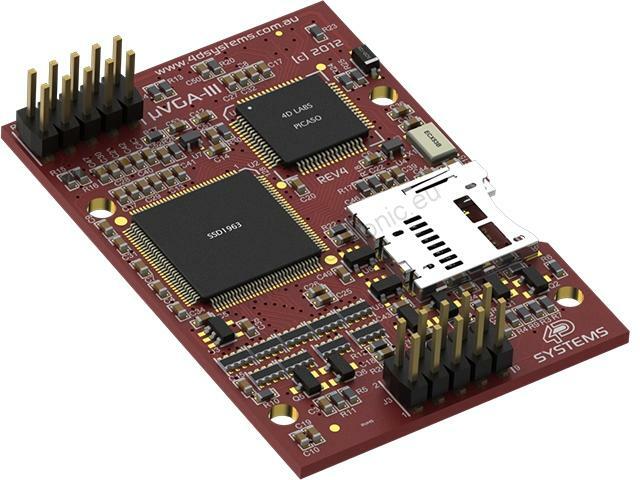 Programmed with 4D Systems Workshop 4 IDE Software, the µVGA-III could be the ideal embedded VGA graphics solution for your project. The PmmC for this product for use with Workshop 4 is available from the Workshop 4 Product Page, on the PmmC/Firmware tab. 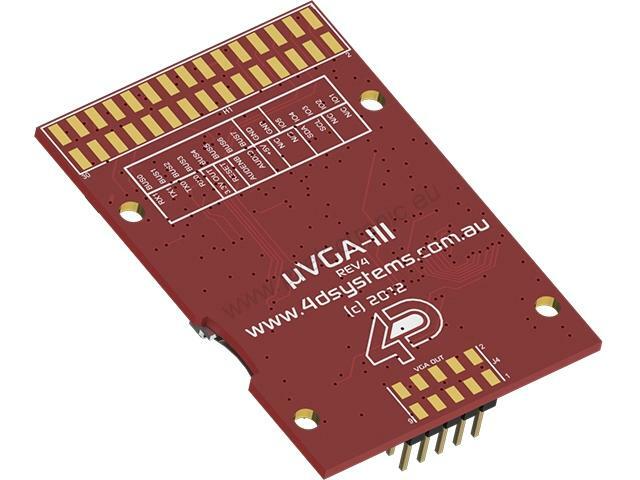 Please download this Product Brief and Datasheet for the µVGA-III module in section below: • µVGA-III Product Brief (Rev 1.1) • µVGA-III Datasheet (Rev 1.3) • µVGA-III 3D PDF (Download latest Adobe Acrobat Reader) Please download this Product Brief and Datasheet for the PICASO Processor in section below: • PICASO Processor Product Brief (Rev 1.0) • PICASO Processor Datasheet (Rev 1.1) Note: The PICASO processor on the Display module can be re-programmed with the latest PmmC/Firmware for updates and future proofing via the Workshop 4 IDE Software. This process requires the use of the 4D Programming cable. Features: • Simple VGA interface to variety of monitors and LCD screens. • Supports the following resolutions, - 320 x 240 (QVGA) - 640 x 480 (VGA) - 800 x 480 (WVGA) • Supports RGB 65K true to life colours. • Easy 5 pin interface to any Serial device: VCC, TX, RX, GND, RESET. • Powered by the 4D-Labs PICASO processor (also available as separate OEM IC for volume users). • 15K bytes of flash memory for user code storage and 14K bytes of SRAM for user variables. • 2 x Asynchronous hardware serial ports (COM0, COM1), TTL interface, with 300 baud to 600K baud. • 1 x I2C interface (Master). • 8 x 16 bit timers with 1 millisecond resolution. • 13 x General Purpose I/O pins. Upper 8 bits can be used as an I/O Bus for fast 8-bit parallel data transfers. • On-board micro-SD memory card adaptor for multimedia storage and data logging purposes. HC memory card support is also available for cards larger than 4Gb. • DOS compatible file access (FAT16 format) as well as low level access to card memory. • Dedicated PWM Audio pin supports FAT16 audio WAV files and complex sound generation. • Built in extensive 4DGL graphics and system library functions. For all available features and functions under the 4DGL programming language. • Display full colour images, animations, icons and video clips. • Supports all available Windows fonts and characters. 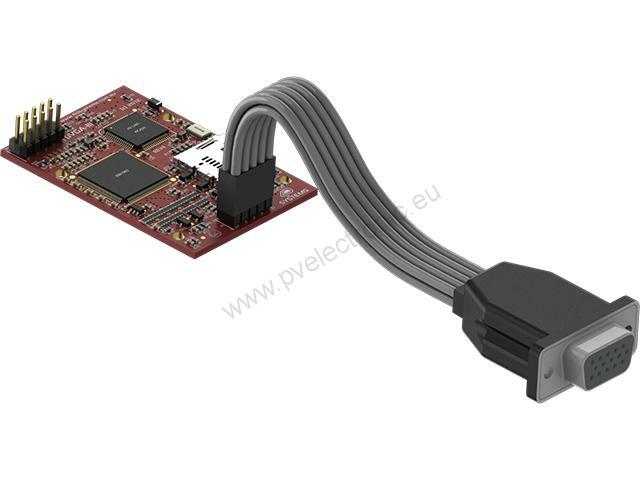 • 15 pin D-type standard VGA connector to interface to any external VGA monitor (via detachable cable, included). • A 30 pin header for I/O expansion and future plug-in daughter boards. • 4.0V to 5.5V range operation (single supply). • Module dimensions: 57.2 x 39mm. • Weighing ~ 17g. • RoHS Compliant. Development Software: 4D Systems all new Workshop 4 IDE supports multiple development environments, to cater for different user requirements and skill level. • The Designer environment enables the user to write 4DGL code in its natural form to program the display module. • A visual programming experience, suitably called ViSi, enables drag-and-drop type placement of objects to assist with 4DGL code generation and allows the user to visualise how the display will look while being developed. • An advanced environment called ViSi-Genie doesn’t require any 4DGL coding at all, it is all done automatically for you. Simply lay the display out with the objects you want (similar to ViSi), set the events to drive them and the code is written for you automatically. ViSi-Genie provides the latest rapid development experience from 4D Systems. • A Serial environment is also provided to transform the display module into a slave serial display module, allowing the user to control the display from any host microcontroller or device with a serial port. The Workshop 4 IDE is available for download from its product page: 4D Workshop 4 IDE What’s included: With each uVGA-III Module, you also receive the following: • 150mm 5 way Female-Female jumper cable, for quick connection to another device or breadboard • 5 way Male-Male adaptor (for converting the Female-Female cable to be Male-Female) • VGA Cable (for connecting the 2x5 way connector on the uVGA-III board with the D-Type VGA Connector of the VGA monitor • 2x15 way SMT Connector (H1) • Quick Start User Guide Other things you may like to purchase seperately are: • 2gb uSD Card • 4D Programming Cable Warranty: Warranty Note: PmmC/Firmware or user application code programming should only be carried out using the 4D Programming cable (4D Programming Cable). Any malfunction because of custom or third party USB to Serial converters or Serial(RS232) to Serial(TTL) level converters will void the warranty. It also applies to all 4D products which require an interface from the PC to the module for testing using 4D Software Test Tools.